Yes I just said salted caramel and Skippy peanut butter in the same sentence. No you are not dreaming. It's real, I promise. What I struggled with is how else do I eat it besides just plain? It's so good I want it all to myself. In the end I decided to initially try 2 things with it. This morning I threw it in my proetein shake. Talk about starting your morning off right. 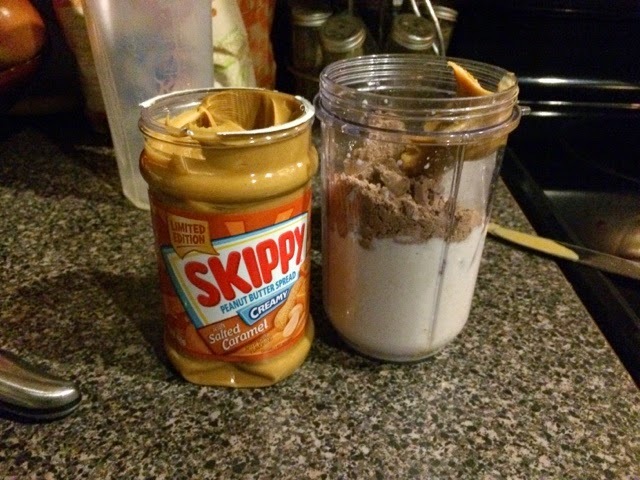 My shake had milk (you could use regular, rice, almond, coconut, etc) 1/2 a banana, 2 ice cubes, 1 scoop chocolate protein powder and a scoop of Skippy's salted caramal peanut butter. It was so good. It was also a nice change to my usual morning shake. Caramel after a workout isn't always that bad, right?! Another thing we had was banana salted caramel peanut butter sandwiches. I spread the special peanut butter on bread and added sliced bananas. It was a fun change for the kids lunch and yummy treat snack for me.